The self-conception of CFDEM is to be an efficient, highly scalable parallel CFD-DEM framework. We would like to motivate you to perform your own benchmarks and provide your results to the user community. 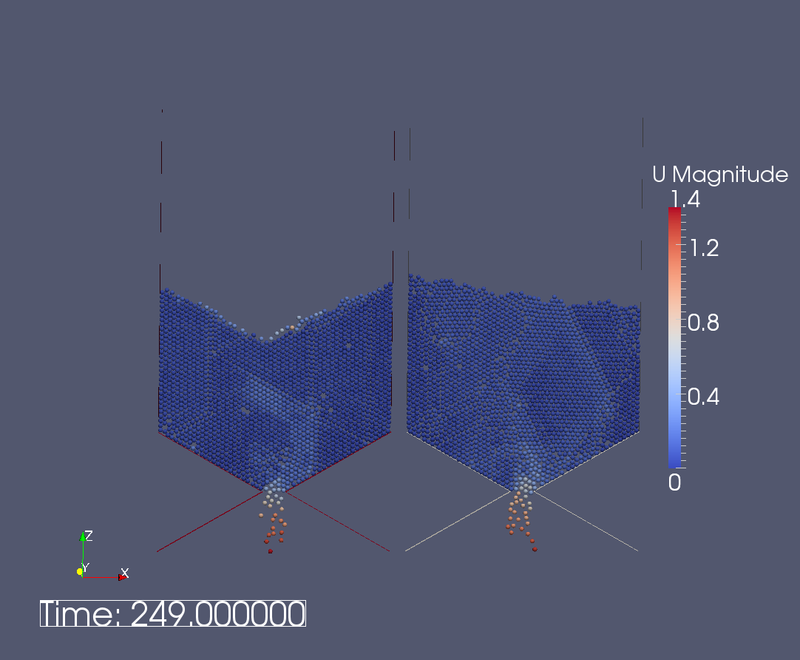 The setup of this test case was inspired by a tutorial case available in OpenFOAM(R)-2.0.0 by OpenCFD. Although we tried to keep the cases as similar as possible, a direct comparison is neither desired nor reasonable. It can although give a rough estimate of the performance and results. Hopper flow with LIGGGHTS (left), compared to original case performed with OpenFOAM(R)-2.0.0. As the models applied are not the the same, this results cannot be used for detailed comparison of the codes!!! We would highly appreciate test and benchmark results from your side to verify or falsify above numbers. This offering is not approved or endorsed by OpenCFD Limited, the producer of the OpenFOAM®software and owner of the OpenFOAM® and OpenCFD® trade marks.